Bitcoin price corrected lower, but climbed back above the USD 5,000 resistance. Ethereum and ripple are trading above key support levels. IOST, DOGE, INB and BCH gained more than 20% today. Yesterday, we discussed about further gains in bitcoin above the USD 5,180 and USD 5,240 resistance levels. BTC did move higher, broke the USD 5,150 resistance, and traded towards the USD 5,275 level. Later, there was a sharp downside correction below USD 5,000. However, declines were limited and the price is now back above the USD 5,000 pivot level. Ethereum and ripple also corrected lower sharply after trading to new yearly highs. 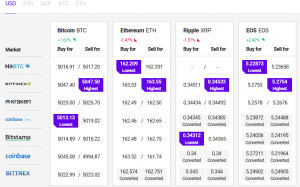 Both ETH and XRP are currently (08:00 AM) trading above key supports and seem to be preparing for the next wave higher. There was a solid upside extension above USD 5,000 in bitcoin price . BTC traded above the USD 5,180 and USD 5,240 resistance levels and tested the USD 5,275 level. Later, it corrected below the USD 5,000 level and tested the USD 4,800 level. A strong buying interest emerged and the price bounced back above USD 5,000. The price is currently consolidating near the USD 5,000 and it may climb higher towards the USD 5,150 or USD 5,200 levels. The next key resistance is at USD 5,275, followed by USD 5,350. On the downside, the main supports are near USD 4,920 and USD 4,800. Ethereum price surged above the USD 170 resistance and traded towards the USD 180 level. ETH traded as high as USD 177 and later corrected sharply below the USD 170 and USD 160 levels. However, the USD 155 level acted as a strong support and the price recovered above the USD 160 level. The price is trading above the USD 160 support and it may rise towards the USD 165 and USD 170 levels. Bitcoin cash price gained a strong bullish momentum and broke the USD 285 and USD 300 resistance levels. BCH/USD even rallied above the USD 320 level and tested the USD 345 zone. Later, there was a downside correction, but the price is now back above USD 300. EOS tested the USD 5.00 support recently and it is currently trading above the USD 5.20 level. The current price action is positive and it seems like the price might continue to rise towards the USD 5.30 or USD 5.50 zone. Ripple price touched a new yearly high near the USD 0.370 level before it corrected lower sharply. XRP/USD tested the USD 0.330 level and it is currently placed nicely above the USD 0.340 level. The next key resistance is at USD 0.350, followed by USD 0.362. In the past three sessions, many small cap altcoins surged higher and gained more than 10% gains, including IOST, DOGE, INB, R, BIX, LSK, ONT, NAS, LTC and ELF. Out of these, IOST is up more than 28% and DOGE is up around 23%. The current technical structure suggests more gains in bitcoin above the USD 5,100 level in the coming sessions. If BTC trades past USD 5,150, it may even climb towards the USD 5,300 level. Conversely, if there is a downside correction, the price might test the USD 4,900 or USD 4,800 support levels.